Destroying a wasp nest only takes a single visit with a guarantee that the nest will no longer be active. A nest will not be re-used once the queen has been destroyed. 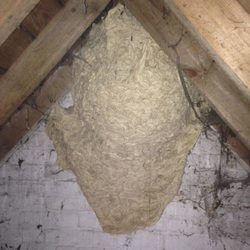 The treated nest should be left in situ so that any wasps that were out foraging become contaminated by it on their return. If it was removed immediately then the returning wasps would attempt to rebuild the nest in the same location. 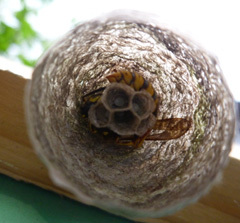 Other wasps will not colonise a treated nest. The queen wasp comes out of hibernation from March when the weather becomes more consistently warm. She will then build a small nest, start laying her eggs and forage for food such as greenfly, caterpillars and other small insects. Through the early part of the summer the worker wasps take over nest building, using chewed wood from fences or trees. The queen wasp releases pheromones to control the workers and tell them what to do. However, this stops during August and she loses control of the nest. The worker wasps then have no purpose and this is when they are particularly interested in your sweet drinks and food and become a nuisance! This usually lasts until the first major frost. The last worker wasps become fertile and leave the nest to hibernate for the following season, thereby becoming next season’s queen wasps. Why do we destroy the wasp nest? If a wasp nest is allowed to go through the full life cycle, the queen will produce up to 100 fertile wasps which become the next season’s queens. These new queens will each set up a new colony the following spring. By August, there might be up to 10,000 worker wasps inside. Wasp stings are unpleasant and can cause severe allergic reactions in some people. In August wasps can cause a lot of damage to fruit stocks and cause disruption to businesses such as food establishments. They can also cause significant damage to property, chewing through materials for their nest. You know you've got a wasp nest when your fence falls down!